So, you are looking for things to sell on eBay and you want to be a successful eBay entrepreneur? It could be a nice little side earner for you, or ideally it could turn into a fulltime job that you make your living from. We are here to tell you that both options are very possible outcomes and though it may take some hard work (especially if you want to make your living from it), if you put in the time, you have all the chance in the world of being a successful eBay seller. If you’d just like to see Wholesale Clearance’s top ten list of the most popular things to sell, click here. However, trends change, things that were once popular can soon fall out of fashion, so we want to give you some tips and processes that we find useful to help you on your journey to selling on eBay. research under your belt and plan, plan, plan. In this blog post, we’re going to offer you some tips, and make some suggestions about what you can sell. The first place to start is researching potential products. Though probably the most time-consuming part of the process, this is a vital stage in deciding what you are going to eventually sell and will impact the successful of your sales campaign. You can be a great seller, but with a bad bunch of products, you’ll find it tough to shift them. It’s incredibly important to spend time researching and not just throw yourself in haphazardly. Remember, anyone can sell on eBay, but to be successful it takes work and thought. First, let’s dispel the myth that the most popular products will mean instant success. The key to successful selling on eBay is to select items that people really want, that mass sellers don’t already target. You are competing against so many other sellers in the market, that it is almost impossible to get your product noticed. The same can be said for iPhone covers. You aren’t just competing against the thousands of people that are trying to sell their own old accessories, you’re also going up against cheap imports from China that flood eBay. What this means is that your profit margins will be well below what you might be hoping for, and realistically, below what would be worth the time it takes to sell/package/post the products. Thinking about who you are selling to and what they would be interested in purchasing can be a great way to start thinking about the kinds of products you are going to sell. Creating a selling persona is one way of doing this. Let’s create a basic example. We’ll call our persona David. David is aged 30, with a steady, 35k a year job. He is interested in sports, staying healthy, fashion and technology. He normally finds himself shopping on his mobile and likes finding good deals. He usually will be shopping during his lunch break on his phone at work, or on his tablet at home in the evenings or at weekends. Using that as a starting point, what would products would David be looking to buy? Some of the ideas may seem random, but that isn’t necessarily a bad thing. Brainstorming is meant to be a fairly fast process, where you throw out as many ideas as possible. Once you have a list of ideas, you can start cutting them down to remove any you don’t think would be realistic. The items you’ll be left with should hopefully present some interesting possibilities of what to sell. You can then begin the process of looking further into the practicalities of selling your chosen items to see which suits your goals the best. You can make a few different personas, with different age ranges, different genders and needs and wants. Another good way avenue to look at when you are building a potential list, is to look at what the big e-commerce giants say is popular. Who better to start with than Amazon? The e-commerce giant’s revenue seems to continually grow year by year, taking over the online market. But how can we use the site to our advantage? Well, Amazon have a really useful ‘Best Sellers’ page on their site, which is updated hourly. You can look through different categories depending on what you are looking to sell. You also get a handy little menu on the left-hand side where you can go even deeper into looking at sub categories. 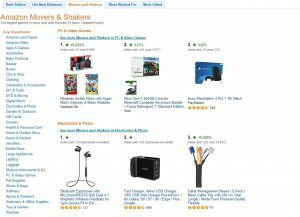 Another section that may be of interest is the Amazon ‘Movers and Shakers’ page. On each category page you’ll see a set of products. Each product has been given a ‘sales rank’, noting its previous ranking against its current position. It looks at which products have made the most gains in sales over the past 24 hours. This gives you an interesting indication of what product is trending each day. You could track this during the week, month and year to see if there is a pattern to sales that you can learn from. The products that have had the highest jump are some of the most fascinating to look at, and by doing a bit of detective work, you can work out what potentially caused the rise. Is it to do with price? Is it seasonal? Has it been paired with another popular item? Has there been something in the news recently? Is there a related event happening soon, like a film being released? Visiting a trade fair is a great way to get ahead of the competition in finding out what to sell. It’s at trade fairs where you’ll get to see what trends the big suppliers are anticipating in the coming season, and you may be able to get some good deals too. We wrote about our recommended trade fairs to visit in a previous post which hopefully will help you pick the ones you’re most interested in attending. One thing that sometimes puts people off heading to a trade show, is the idea that their business isn’t big enough. We would urge you not to worry about this at all. There are many suppliers out there with minimum orders of £100 or £150. The advantage of sourcing suppliers in the UK is that you can buy a variety of products (or the same product but in a variety of colours and sizes) in minimal quantities (if this is what you are after). This will really appeal to those of you running a small business from home. Google has become so commonplace in our everyday lives that it even became a verb. As the most popular search engine on the web, it can be an incredibly powerful tool when it comes to finding out what people are searching for. But how can we harness this? Enter Google Trends. You can use this useful page to help give you an idea of how popular the item you are looking at selling is, and what in months and dates it is in highest demand. We can see from this roller coaster-esque graph that there are times of peak search volume for ‘portable charger’, and that they always seem to fall in the main holiday months of December, June, July and August. This gives us the clear indication that if we wanted to sell one of these to someone like David, we’d be best getting them ready for just before the holiday season and selling right the way through them. You can use the different drop-down menus to look at different countries, choose the date range, the type of search (web, image, news or YouTube) and the category of the item you are searching. We used ‘shopping’ as a category for this example. You can see in the lead up to Christmas that the volume starts to rise in volume before peaking just before the 25th and dropping dramatically after. 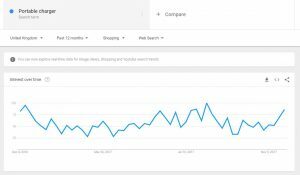 Ideally you want to be selling products as they increase in popularity not as they’re on a downward spiral, so Google Trends can give you an indication how early or late in the game you are with a product’s selling cycle. If it’s starting to drop sharply, it is not usually worth the time investing in the product. Now this may be because adult colouring books are easy to get hold of in discount outlets whereas they weren’t previously. It could also be due to interest waning. This shows us that just because a product is trending one year, it doesn’t mean you should be looking to sell it the following year. Think of selling on eBay a bit like surfing, you want to catch the trend wave at just the right time. Too early, and you’ll have a long wait to start shifting your stock (which may cause issues with storage space – we’ll discuss this later in the article), too late and everyone already has what you are offering. It is common sense which should prevail when you are picking products to sell on eBay. If your buyers can purchase items easily with their weekly shop, they will do. If they can’t, they’ll go online. It pays you to take the time to think about what is easily available and what isn’t. The graph shows the 42 days leading up to when the product started trending. On this particular day, you can see the array of Christmas related items here. You can also see the Star Wars t-shirt, with the new Star Wars film set to hit the cinema, this product has risen dramatically. These kinds of events should be prepared months in advance, getting in the correct stock for the occasion. It might be worth creating your own event calendar for this. Looking up anniversaries, dates or events that could be of use. We have found sites such as https://www.ianvisits.co.uk/anniversaries/ and https://www.movieinsider.com/movies/-/2018 of use at various times. Looking at this example of Sufragette Pins & Badges. The trend rise looks like it was accounted for by the anniversary of when the Representation of the People Act 1918 was passed on February 6th granting women over the age of 30 the chance to vote. Next year will be the centenary of this momentous event, so you could assume there may be even more sales of these to be had. There are some great foreign retail websites that deal in wholesale goods that you should have a look at. They also have a ‘Top Selected Suppliers’ section, which can be useful. Other sites we would recommend are Deal Extreme, DH Gate, Focal Price, Fasttech and Ali Express. You can find some great deals on these sites. One thing that is vital to remember is you will have to buy minimum quantities (usually 100) and you may even need to buy items in large batches, regardless of size or colour. This will usually make sense for those with a bigger budget. You’ll also need a safe and dry area with enough room to store the stock. Speaking of storage – be sensible with what you’re aiming to source. Think about when and why you are buying it in. There is no point in ordering several hundred woolly hats in March if you’re unlikely to sell them until September. You’ll often see big retail brands struggle with this when they have excess stock of coats in the UK because the winter has been unseasonably mild. It’s very important to try to plan for these kinds of issues. One tip for some of these sites to remember is that you mostly want to steer clear of branded items. If you are ordering from somewhere like China, you could end up with fake goods. So, as the old saying goes if a deal seems too good to be true, it’s because it usually is. Why Not Browse Our Site? being wary of branded items. Well, we often get small quantities of branded items when retailers go bankrupt. Have a browse through our latest bankrupt stock to see what gems you can uncover. Separately, we’d recommend you also checkout The Wholesale Forums for more advice too. Here’s our current list of the most popular things to sell on eBay.co.uk and eBay.com. See if anything here tickles your fancy. Memorabilia and Vintage – One man’s junk is another man’s treasure. Trends often swing back round, and items that were once uncool, now have become vintage and sellable. Vintage items aren’t just fashion either, they can be fireplaces, kitchen equipment, old sweet tins and leather goods. Vintage effect items are pretty popular too, so look out for anything that looks retro or nostalgic. Toys and stuffed animals – As the hundreds of adverts you see every testify to, the children’s market is a big one and you can make a killing on eBay if you have the right products at the right time. It’s important therefore to keep up to date with children’s toy trends and upcoming products. Trends can be hard to spot, so old staples like soft toys, dolls, puzzles and instruments will always sell well. Disney and other popular children’s brands – High Street Musical is one of the most searched items on eBay in recent years and Disney will always performs well. We’ve also seen current trends on eBay.com that include Spiderman and WWF in recent times. Electronics – Electronics are very popular on eBay. This is because customers can search for similar items and then spend time comparing them with the aim to bid on the best bargains. The top ten searches within electronics tend to be focused around gaming consoles, but cameras, mobiles, and printers also feature. The potential mark up on these is great, so if you spot a good wholesale deal, snap it up! Clothing – Always popular. Customers are looking for decent clothing at a cheaper price than they can find on the High Street. They don’t want to pay parking costs, £4 for a cup of coffee, and they like to try things on in the comfort of their own homes. Offer no quibble refunds to draw your customers in. Sports goods – The current vogue to wear sports clothing as leisure wear means has meant that sports shops have been very successful in recent years. By offering good quality clothing at an attractive price you can hook in potential buyers. Nike sportswear and other recognisable brands do really well. Other sports products (other than clothes) also can sell well if you choose the right items. Handbags and accessories – Accessories and handbags, priced to sell, will always do well, because they seem like an affordable treat to customers. Small items such as nail varnish tend to do very well on eBay too. Jewellery – The demand for jewellery on eBay never seems to fluctuate. It’s an incredible seller. We have seen a trend recently for tanzanite rings and vintage effect jewellery, which might be worth grabbing onto the sparkly coattails of. Branded and designer – If you have items that are branded or designer then they are much more likely to sell. Pet supplies. The British are potty about their pets and this is reflected in a booming pet supply industry. You can sell food, collars, bowls, beds, clothing, and bow ties, anything you like. People love to spoil their pets. Just one last point to consider – Often, it’s not just about selling what people want, but about selling people what they need. If you do have items classed as non-necessities, then sell people what they desire at a price that is attractive to them. For example, toothbrushes are doing really well on eBay at the moment. Customers can pick them up at the supermarket however, so what can you cut your margin to in order to sell them quickly and still make a profit? Above all else sell smart! Thank you for a well thought out and inspirational article! All Disney, right back to ‘Bambi’, Mickey Mouse etc., is still popular and I fully expect genuine ‘Frozen’ merchandise to appear on the surplus market in 2017. You are absolutely right to be careful of counterfeit goods. Some years ago my neighbour, writer and illustrator of ‘Maisie Mouse’, was congratulated for the appearance, unknown to her, of children’s bedding decorated with her character sold in ‘British Home Stores’. Naturally, this large chain-store immediately withdrew the range. Go on, search for ‘Maisie Mouse’ and help my ex neighbour and friend Lucy Cousins. My six-eight-year old daughter inspired some of the plot-lines. Generally, they deal with everyday situations for a small child. The Japanese video translation is delightful! Try with http://www.wuanto.com to find the most Popular items on Ebay! It’s my secret weapon. A highly relevant (crucial even) issue is shipping cost. The difference between a ‘Large Letter’ and a ‘Small Packet’ can double the cost of postage. I sell books and this is a major issue. Flat things, under 750 grams have an inbuilt agvantage if you are posting on modest quatities. People do like Free Shipping. forget ebay its been dead for a long time now for sellers with chine wholesalers dominating the markets! « Shhh! Heard about Shpock? New rival to eBay?